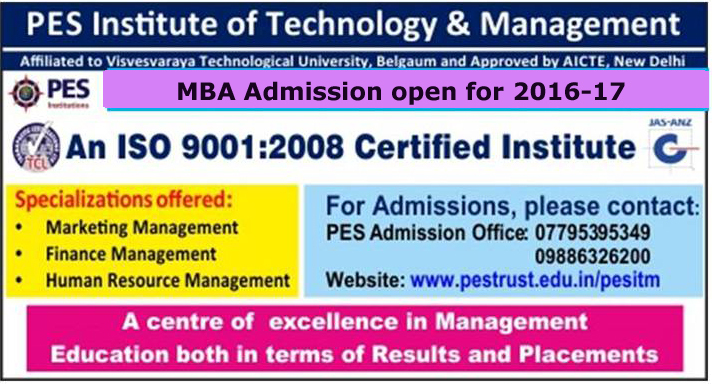 Admission to MBA programme is through PGCET for Govt Quota( 60 only) seats( Through centralized counselling by Karnataka Examination Authority/Govt. 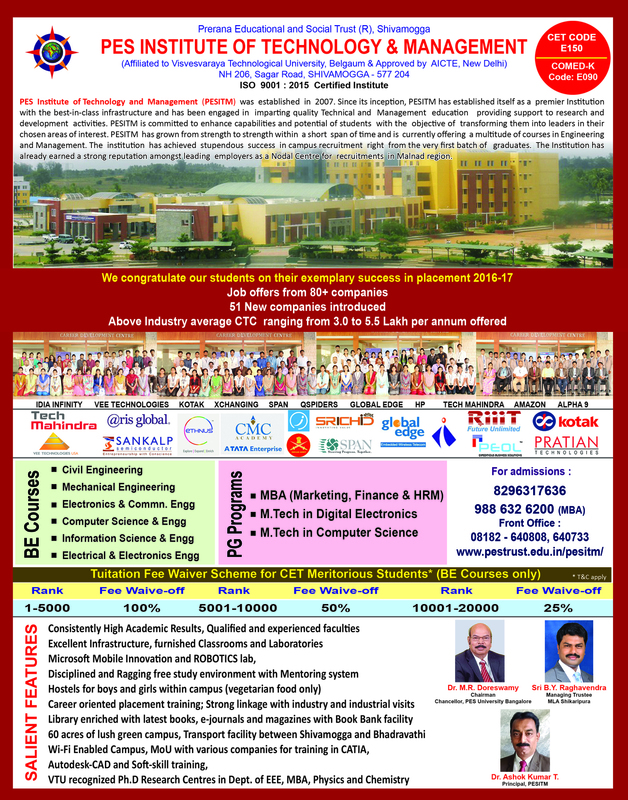 of Karnataka) and CMAT/KMAT/PGCET for Management Quota( 60 only) seats. Therefore, there will be a fair representation of students from different regions of the state. Greetings from PES Institute of Technology and Management (PESITM), Shivamogga. We have great pleasure in introducing ourselves as one of the best engineering colleges in the Malnad region of Karnataka. The college was founded in the year 2007 by Prerana Educational and Social Trust ®, and since its inception it is imparting quality technical and management education with the best-in-class infrastructure and dedicated team of faculty members. The institute is also providing support to research and development activities as well, and is presently offering 6 BE courses, one MBA programme, 3 Ph.D. Research Centres and two M.Tech programmes in Digital Electronics and Computer Science & Engg. We are an ISO 9001: 2008 certified institution, approved by AICTE, New Delhi, recognized by Govt. of Karnataka and affiliated to Visvesvaraya Technological University (VTU), Belagavi, located in the serene and calm campus away from the din and bustle of the city. The PG classrooms are provided with modern teaching-learning equipments including multi-media projectors, wi-fi facility, state-of-art computer laboratories and access to digital library and e-learning materials having innumerable books, periodicals and journals of National & International repute. Apart from regular laboratory practices, our students get exposed to the development of mobile apps and experience hands-on trainings in our Microsoft Mobile Innovation Laboratory and Robotics Laboratory (e-Yantra) established by IIT, Mumbai. We have a dedicated Centre for Corporate Relations, which manages Training & Placement activities and provides exclusively structured Personality Development & Soft Skills Training Programmes to students. Our UG and PG students have received 450+ job offers from 35+ recruiters during 2014-15. All the 2014-15 batch M. Tech students of Digital Electronics and Computer Science have received internship offers in companies. We ensure excellent institute – industry interaction; we organize industrial visits, National and International Conferences, Seminars and Workshops by inviting experts from industry and academia. Students are encouraged and sponsored to participate and present research papers in seminars and conferences held across the State. Our hostel facility provides hygienic and homely food for students residing in the hostels. In addition to the above, medical facility and abundant indoor and outdoor games & sports facilities are also available on campus. Dear students, it is true that PESITM believes in the concept of holistic development of students. Having put in best of our efforts in this direction, we take pleasure in welcoming you to pursue your postgraduate studies at PESITM in the department of Electronics & Communication Engg. and Computer Science by opting for PESITM on top priority in PGCET counseling. We wish you all the best. Let your dreams of pursuing PG studies come true.